We want to feature YOU in our summer campaign! We've partnered with Scout Model Agency to cast our members as models in our upcoming summer campaign! 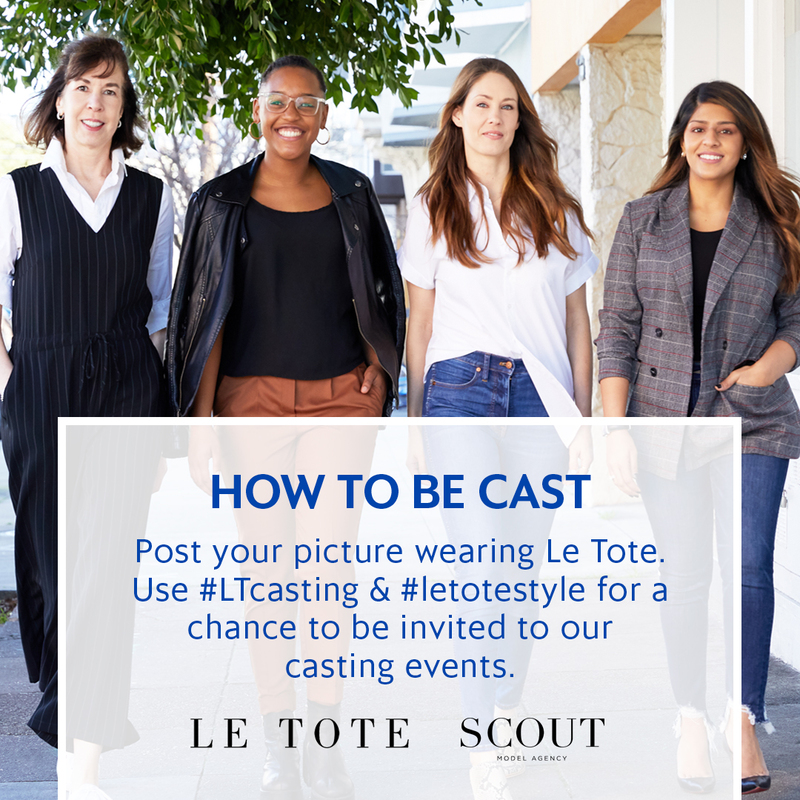 For the chance to be invited to our casting events in San Francisco (April 30), NYC (May 6) & Chicago (May 9), just post a picture wearing Le Tote on Instagram. Don't forget to tag @letote and use #LTcasting and #letotestyle. Remove any extra clutter. Extra cables, recycle bins, pens, just excess "stuff" causes the eye to dance around the picture and not focus on you. Get outside! Make sure the light is good. Back lit is not ideal and bathroom lighting is really harsh. As a general rule bathroom selfies aren't usually the strongest images. Front lighting is beauty lighting. If you can ask your friend to shoot this picture, ask her to stand where the window is. The light is going to be bright, soft and flattering. Keep in mind that the image will be posted as a square for Instagram so shoot in square mode for the best composition. Last but not the least, SMILE! About our partner: Scout strives to offer personal and quality representation to all of its models across all divisions and this is an opportunity for our members to be scouted by an agency that is expanding to diversify their model and influencer division. With the 25+ years of experience between their agents, they offer a comprehensive management style that is truly unique.